The UK’s referendum on 23 June 2016 has now created a new word and place in the English dictionary – Brexit. The referendum result – a win by 52% to 48% for the Leavers – means that the UK’s current crop of politicians has to negotiate an exit for the UK from the EU i.e. they have to deliver Brexit. Within hours of the Brexit vote there was a rush for the exit by many leading politicians on the Leave side of the debate, and a flood of Google inquiries from confused Leave voters asking, “What is the EU?” Equally trivial but much more alarming, the new Prime Minister began her tenure by stating, “Brexit means Brexit”. Yeah! Where better to start this series of Brexit Blogs than by using the PM’s words? In my house, which is reasonably well ordered, if I replied to an inquiry about what I wanted to eat in the morning by replying, “breakfast means breakfast” I would get a funny look. And if I repeated my response I would most likely get a bowl of muesli and fresh fruit (my wife’s favourite) rather than brown toast, boiled eggs or porridge (my favourites). In other words, my reply would be distinctly unhelpful to any genuine query about what I wanted to eat and I should then expect a random choice of food at the breakfast table (if not a referral to my GP – are you feeling alright dear?). I feel the same way about the Prime Minister’s response – very unhelpful and in need of a withering look and a nudge to remind me to take my tablets. To make matters worse, Brexit means Brexit is now repeated ad nauseam by all and sundry in the media. All this disguises something that is much more important than my choice of breakfast fare. The people who pay the Prime Minister’s salary (you and me and other taxpayers in the pigmeat supply chain, and the commercial world in general) deserve better than this. Commercial decisions have to be made now and next week and next month about production, trade and investment in our industry and yet there is no glimmer of what the shape, timing or final form of a Brexit deal will be: not a glimmer. Yet leading politicos seem to think it is enough to parrot, “Brexit means Brexit”. It’s the same disdain that Marie Antoinette showed for real people struggling to make their lives better. Let them eat Brexit! Another big slice of uncertainty has been dropped unceremoniously into the business environment. Along with uncertainty we have its horrible little sister – risk. Employment, profits and even the survival of businesses will depend on decisions that will probably be affected by the Brexit negotiations and these decisions are now open to the risk of being wildly wrong. That’s tough if it’s your job, your profit, or your investment. Hence, managing the risks associated with Brexit is now something that responsible workers, business owners and investors will have to undertake – as if they didn’t have enough to do. Another problem is that the Brexit discussions and negotiations are likely to be with us for some time – spanning several production periods. This will affect UK producers and processors but also overseas producers and processors who have an interest in the UK market either as an investment opportunity or as a consumer market. Canadian and US pork exporters may well see UK households as a new target given the Brexiteers’ declared enthusiasm to open up Britain to global trade in a post-EU world. And the UK’s farmers will no longer be able to count on French, German and Spanish votes in the Council of Ministers to protect them from global competition. I have no doubt that the UK Treasury will welcome cheap farm products from abroad and will resist any and every farm policy proposal that might support agriculture – even if such proposals ever comply with WTO rules (something the commentators seem to ignore in their rush to usher in the new “sovereign” post-EU world for British industry and agriculture. 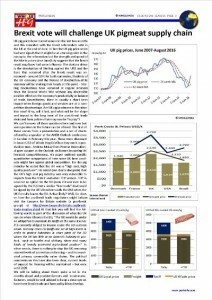 Furthermore, the UK agro-industry supply chain, including UK pigmeat processors who depend on immigrant labour, will face increased costs for workers either through more bureaucracy to comply with new immigration controls or through the reduced availability of workers, or both. If this all sounds like a threat – it is. The risk is that it could easily be the new reality and thus affect margins, market potential and the returns on investment for years ahead. It’s not that Brexit means Brexit – rather that Brexit is a dog’s breakfast. I have begun the process of identifying where the opportunities and challenges for the different players in the global pigmeat supply chain in the August 2016 issue of Whole Hog Brief. I suspect that this is a subject we will be examining for several months yet – watch this space.